©Benjamin Petit. Pictured is ©Jean-Pierre Laffont's photograph, The caption reads: College Station, Texas, USA. May 23, 1981. A child learns to use a revolver in a specialized school founded by retired Colonel Sid Loveless. Parents are progressively sending their children at an earlier age to participate to these train-ings. From the sleepy streets of Kraków,­ to the bustling boulevards of Paris, #Dysturb has become a force to be reckoned with. Armed with glue, this team installs large-format, black and white, current photojournalism pieces, which speak a universal language. So, what makes this project unique? #Dysturb utilizes two of the most influential tools of communication: word of mouth and soc­ial media. In the age of digital, when mobile platforms reign over all, and publications are struggling with their business models (to subscribe or not to subscribe, that is the question), we’ve seen a new wave of storytellers seep through the cracks of indecision. #Dysturb isn’t simply about supporting photojournalism—an industry that has seen major cuts in funding. It is also a project that critically examines and provokes discussion about current events shaping our world. They contextualize the stories they share, whether it be through an in-depth caption on the side of a paste-up, or geo-tagging. 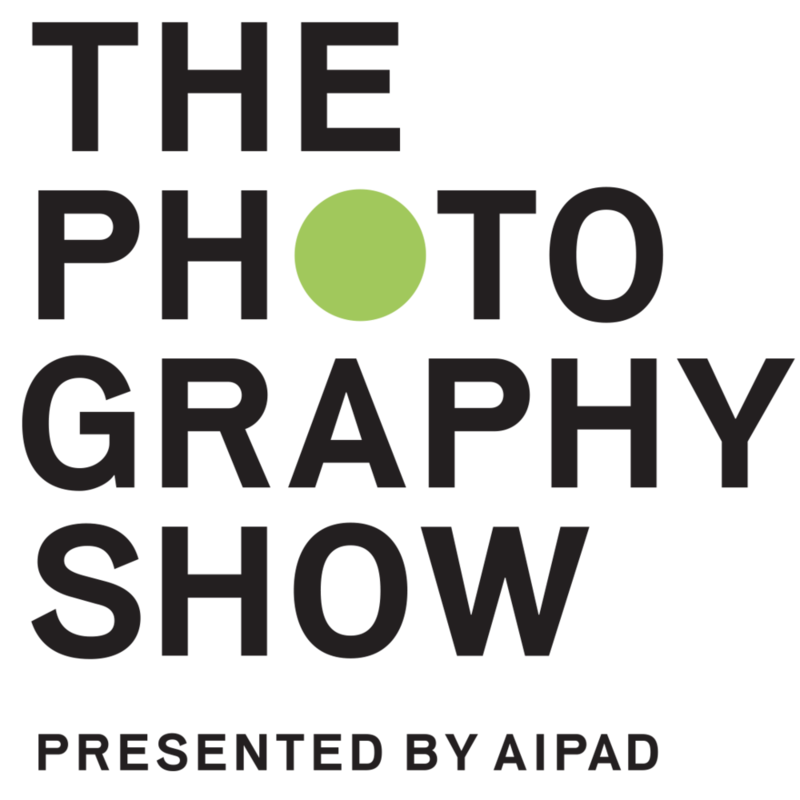 They also offer viewers an interaction, either with the photojournalist who took the image, the subject, or issue at hand. Kyla Woods chats with #Dysturb’s founders, Pierre Terdjman and Benjamin Girette, about the progress of their project, their past campaigns, and their future prospects. ©Renaud Philippe. 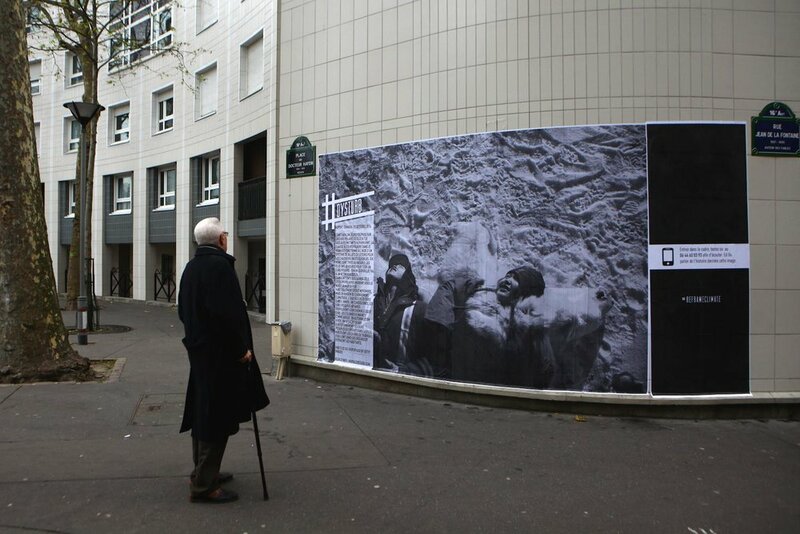 Earlier this year, we pasted Patrick Witty's photograph at Rue du Pont / Rue de la Reine, Neigh-borhood Saint Roch. The caption reads: Lesbos, Greece, 23/28 in September, 2015: Every day hundreds of refugees tie up on the Greek coast. Piled up on overpopulated inflatable boats, the refugees undertake a risky and extremely dangerous journey since Turkey to Greece with the hope of a new life in Europe. From the beginning of 2015, the number of migrants who uses the "road of the Balkans" exploded with the migrants arriving in Greece before entering the European Union via Hungary. KW: When and how did #Dysturb begin? PT: A few years ago, the industry saw a shift towards hiring freelancers. Contract photographers were laid off, and funding was cut. We [freelancers] can barely cover expenses, let alone afford insurance—especially if we are based in precarious locations. BG: Photographers can spend weeks or months on a story. When these stories are published, they have a tendency to disappear. Sometimes they aren’t even picked up because the subject matter isn’t appealing. PT: #Dysturb started as not only a way to combat the growing despair photojournalists felt, but also as a way to transcend the news cycle, and also to give the public access to free information that they’d normally never see—we only paste international news within a country. ©Justin Mignot. For #Contact16, we pasted ©Jake Naughton's photograph at 56 Kensington Ave, Toronto. The caption reads: Nairobi, Kenya. June 17, 2015: S. is one of hundreds of African LGBT refugees who flee their home countries to go to Kenya due to persecution and violence, only to face the similar discrimination there. Most will eventually be resettled in the West, but that can take years. They wait in Kenya, hoping the worst doesn't happen. Soon after arriving, seven men with machetes broke into S.'s home and attacked him. Here, he poses for a portrait in the apartment he shared with his boyfriend (though they have since moved), with one scar from the attack clearly visible. Others on his face and chest are not seen. KW: Is what you do illegal? BG: Not really, because we do not vandalize property. These images aren't intended to be permanent installations, and there is a poetry in that, especially when we consider the disposable news cycle. PT: We use wheat paste and biodegradable material; this allows for easy removal if need be. Normally, we do seek permission. However, if there is an altercation, whether it be with police officers or property owners, we explain to them the project and usually they understand. BG: Recently, we had an incident where a resident located near an outdoor installation was offended by an image. We calmly, and respectfully explained our project, the relevance of the image, and how it was chosen. To our surprise, she responded that our work should be more visible and that it was an important initiative. PT: It’s important to us when we are contacted like this to always discuss the issue, and we began a productive conversation with the resident resulting in an understanding of our project. ©Benjamin Petit. At the Cold Tea Bar, you'll come across ©Líam Maloney's photograph. The caption reads: Akkar, Lebanon. July 9, 2013. First day of Ramadan. "Where are you? Every time you can, talk to me so I know you are safe." Reply from Homs : "Yes now things are ok, the bombing has stopped, I" "..." Near the Syrian border, 110 Syrian refugees from Homs live in tents set up within a disused slaughterhouse. At night, they get on their phones and text their friends and family under siege, hoping for news and arranging the complex logistics to flee Syria. KW: You just completed a massive campaign in Toronto to mark the 20th anniversary of the CONTACT Photography Festival. This was the first time you’ve teamed up with Instagram, a platform that isn’t known for its photojournalism. Can you speak about this? PT: Instagram has really helped to support the photojournalism community by highlighting the feeds of photojournalists. We’ve seen established photographers like David Guttenfelder, Benjamin Lowy, Michael Christopher Brown, Maggie Steber, and John Stanmeyer reaffirm their presences in the digital world. But we’ve also seen great emerging talent shine through—Devin Allen and his coverage of Baltimore is a great example of this. Not only did he win cover of the year for his iconic image, but also he has seen himself build a steady and deep-rooted presence on the platform. BG: For this campaign, titled #DysturbxCONTACT16, which was spearheaded by our U.S. operations manager Benjamin Petit, we collaborated with Instagram to bring the work of world recognized photojournalists—Donald Weber (VII Photo), Ed Ou (Getty Reportage), Sim Chi Yin (VII Photo), Daniel Berehulak, Andrew Quilty (Oculi) and more—to the streets of Toronto. This was the first time we really mixed our content both on the streets and online. The reason for this is because different types of content resonate with different types of people or communities. Unfortunately, when images are published in media outlets, they have an interesting way of dividing communities. Our aim was to join communities by creating a dialogue about select global issues. PT: When Benjamin says, “dividing communities,” what he means is that there is a large amount of distrust towards media outlets and every time we enter a school, this is the first thing students say to us. By the way, this isn’t the photographer’s fault—editing of captions, and the addition of misleading titles or slugs are contributing factors. Perhaps it’s best to say they reaffirm a community’s beliefs and, in doing so, segregate them from others more. Anyway, our goal is to bring everyone together. ©Benjamin Girette. Tim Hetherington's (Magnum) photo was pasted at 57/59 quai de Valmy 75010 for the launch of Moises Saman’s book “Discordia.” The caption reads: Afghanistan. Korengal Valley, Kunar Province. July 2008. Specialist Steve Kim sleeping. Tim Hetherington was perpetually curious about the roots of human violence and the endless history of men and war. The photographic series “Sleeping Soldiers” was made in one of Afghanistan’s fiercest battle fields and is a meditation on vulnerability and aggression, guiding the viewer to a different understanding of men who fight. Tim was killed by a mortar attack in Libya on 20 April 2011. KW: I just want to touch on what you said, Benjamin, about selecting global issues. How do you select which images/photographers will be selected for a campaign? BG: We have found that our work is more effective if we center a campaign around a theme. For example, for our #ReframeClimate installation for COP21—which we collaborated with the Magnum Foundation, Yale School of Forestry & Environmental Studies, ITP-NYU students, and Twilio for—we curated 25 images by documentary photographers across a vast range of countries and agencies that showed the effect of climate change on the global community. PT: We wanted to put a real face on climate change, and so we made it an interactive experience by including the photographer’s personal account of the story-behind-the-image. Instagram was very receptive to this project and actually helped push #Dysturb’s presence in a more affirmative direction. We also had support from model and activist Cameron Russell as well as organizations like ArtCOP21 and Le Monde featured us. ©Benjamin Girette. For COP21, we teamed up with the Magnum Foundation, Yale School of Forestry and Environ-mental Studies, NYU-ITP Students & Twillio to #reframeclimate by pasting current photojournalism in the streets of Paris. Pictured is Katie Orlinsky's photograph that was pasted in Paris. The caption reads: The traditional blanket toss at the annual whaling feast in Point Hope, Alaska on June 16, 2015. For the Inupiat villagers of Point Hope, nothing is more important than the bowhead whale. The calendar year revolves around hunting, fishing and gathering, a lifestyle Alaskans call “subsistence,” which is as much cultural tradition as economic necessity. The entire village looks for-ward to spring whaling, and celebrates a successful hunt with an annual feast. In recent years, however, the much-anticipated whale hunt has run up against a warming Arctic. Ice is getting thinner, windows of opportunity for hunting are shrinking and animal behavior is changing. Alaska had its hottest year on record in 2014, and for Inupiat villagers in Point Hope who have hunted and foraged their meals for generations, climate change now threatens their way of life. BG: We do put a lot of thought into this, and it's actually a very strenuous task. We want to make sure that we stay true to our core value—supporting photojournalists—so we do mix emerging photographers with bigger names. We also want to be current, so we have to do a lot of research about what’s happening in the world. PT: We have built a great team that helps with this. © Benjamin Girette. For COP21, we teamed up with the Magnum Foundation, Yale School of Forestry and Environ-mental Studies, NYU-ITP Students & Twillio to #reframeclimate by pasting current photojournalism in the streets of Paris. Pictured is ©Evgenia Arbugaeva's photograph which can be found on 3-5 Passage des Récollets. The caption reads: Russia, June 8th, 2012. Many years ago uncle Vanya arrived to a small Arc-tic port town Tiksi from Riga as a sailor on a ship and immediately fell in love with the place and stayed. Now every June when Laptev Sea starts to melt, he catches the moment to fish in the cracks of the ice. KW: What about when you work with schools? This is a big part of your project and I guess something that is a little harder to create a theme around. PT: I’ve always taught or lectured at schools, and in recent years I’ve noticed how dismissive students would be about information coming from media outlets. Most of the time, there is no real theme of images—if there is an international campaign occurring, for example the COP21 or International Women’s Day, then we will coincide our installation at the school with that. Otherwise, it’s dictated by current news events and how much coverage they are getting in certain countries. BG: As our project has grown, we now give students a choice between a group of images. We are working on a project in Australia where groups of students research a global issue, then pair that with one of the #Dysturb paste-ups. The students then go out and paste it in a location they have scouted. PT: This is a hands-on approach that we believe further engages with younger people and actually gets them to think more about why they’ve chosen an image and who they want to show it to. This has been very responsive. ©Madélena Rehorek. Earlier this year, McKinnon Secondary College students finish pasting Juliette Robert's (Hay-tham Pictures) photograph of Madagascar's evangelical community. The caption reads: Soatanana, Madagascar. October 26, 2014. Soatanana, 400 km south of the capital Antananarivo, is also known as "The white village," after the color of the villagers’ clothes. This evangelical community is unique in Madagascar: Its fields belong to the community and the resources and workload are shared. Every Sunday, the adepts gather for a procession and walk through the village while singing, before and after the mass. KW: Which places has the #Dysturb project been receptive in? BG: We’ve also had successful campaigns in New York, Sarajevo, Montreal, Tbilisi (Georgia), Sicily, London, Sydney, and more. In saying that, the whole of Europe has been receptive to our project. One of our biggest operations was an initiative with the European Parliament for International Women’s Day 2016. PT: For this, we travelled to three different countries and pasted images by Marie Dorigny, Yannis Behrakis (Reuters), Sergey Ponomarev, Marko Djurica (Reuters) Emin Özmen, Olivier Jobard (M.Y.O.P. ), Olmo Calvo, and more. This was powerful because these photojournalists have been covering the refugee crisis on a long-term basis, and these images showed the plight of female refugees during their journey across Europe. ©Benjamin Girette. On the occasion of International Women’s Day 2016, the European Parliament and #Dysturb have joined forces to raise awareness about the plight of women refugees during their grueling journey across Europe. The photographs are the work of various talented European photojournalists and are displayed in Brussels, Paris, and Barcelona. This is the photo taken by ©Marie Dorigny, and it's glued at Anspachlaan 85. The caption reads: Moria Hotspot, Lesbos, Greece, 9 December 2015. The wait for registration formalities lasts many long hours because of the large number of refugees arriving every day on the island, forc-ing many to spend the night in the camp in difficult conditions. BG: On a smaller scale, our Asia-Pacific manager, Madelena Rehorek, has spearheaded collaborations with The Royal Melbourne Institute of Technology and The Photography Studies College in Melbourne. We also regularly collaborate with McKinnon Secondary College. PT: And, we also continuously collaborate with the L’ŒIL URBAIN (Urban Eye) Festival, and schools within Paris. Visa pour l’Image and WARM Festival have also supported us from the beginning. KW: How do you fund this project? BG: In the beginning, we funded #Dysturb by ourselves. However, we now sustain ourselves through collaborations with organizations and festivals—we are covering operational costs. PT: I would like to clarify, we don’t use advertisements for revenue. BG: We are still actively looking for foundations and organizations that would like to help us to develop our project worldwide. Many countries are calling for #Dysturb actions and we need help to answer them all. PT: Our educational platform is on its way, and we are eager to find partners to reach as many schools as possible in the next few months! ©Benjamin Girette. For the Krakow Photomonth Festival 2016, we pasted ©Francesco Zizola's (NOOR) photograph at Józefińska 23, 33-332 Kraków, Poland. The caption reads: 23 August 2015 - Italian coast. After spending two days and two nights on the MSF Bourbon Argos, rescued migrants catch sight of the Italian coast for the first time. KW: #Dystub recently made an appearance at the World Press Photo 2016. This is quite an achievement—can you speak a little about this? PT: We joined with the World Press Foundation to paste 10 images around Amsterdam. This was for the 2016 World Press Freedom Day, and this freedom is something that is important for a citizen, and even more so for press. BG: This was also a stepping-stone towards a future collaboration with WPP—we hope to work with them to strengthen our educational component. KW: You were at LOOK3 this year? PT: Yes, we teamed up once more with Instagram and Magnum Foundation for LOOK3. BG: Yes, this was a continuation of the #ReframeClimate initiative, which began during COP21 Climate Change Summit. We had the SMS prompt, which enabled viewers to step into the frame to get a clearer context from the photographer. PT: Climate change is one of the most important issues facing our world. We, the viewer, should feel a personal connection between them, the image and the photographer. To do this, we switched between different kinds of content such as video recordings of the photojournalists speaking about the story behind the image, the original photograph that was installed, along with installation shots, hyperlapses, boomerangs and slo-mo videos, all of which were disseminated on Instagram. BG: We do have other campaigns coming up, but we are really trying to focus on developing #Dysturb as an educational tool. ©Pierre Terdjman. Here is ©Ed Ou's image which was installed at Place du Docteur Hayem. The caption reads: Arviat, Canada - October 31 Janet Ayalok (right) lies on a polar bear that she shot moments earlier in Arviat, Canada on Oct. 31, 2014. Polar bear hunting in Nunavut works on a lottery tag system for eligible Inuit hunters. Ten names are randomly drawn out of a box; the chosen have 48 hours to successfully kill a polar bear – if not, their tag goes to another hunter. The event is a highlight of the hunting season, the community get heavily involved hop-ing to get a ticket. The polar bear hunt follows very strict rules – female polar bears with cubs, cubs, and males under a certain size cannot be shot. If a polar bear was killed in self-defense at any time that year, the kill is subtracted from the number of tags allotted to the community. Waiting for the sea to freeze over so they can go out on the ice to hunt seals; polar bears generally migrate North along the Hudson Bay coast from late summer to early November. The sea usually freezes in early November, but due to a change in climate over the last few decades, the water freezes much later in the year, and less ice has been forming. It is becoming more difficult for polar bears to reach their prime hunting spots on the ice. As a result, famished polar bears searching for food make their way into human settlements like Arviat. In the fall and winter, there are almost daily sightings of polar bears wandering into the town, harassing sled dogs, rummaging through trash and scaring residents. This gives many Inuit a potentially false sense of abundance of these wild, dangerous animals while it alarms scientists to the growing desperation of the polar bears. A single polar bear pelt can sell for over ten thousand dollars – economic salvation for many im-poverished families. Listing the polar bear as a threatened species, the United States and many environmental groups have pushed for a global ban on the commercial trade of their fur, meat, and body parts. The Canadian government opposes this, on behalf of the Inuit. The current de-bate highlights the clash between traditional hunting practices and modern conservation science. KW: How do you see #Dysturb progressing? BG: We want to continue to grow our global network of dedicated, professional photojournalists, and enable them in such a way as to cut out the middle man and move forward with connecting directly with their audience through streets and social media. PT: #Dysturb will continue to bring awareness to international news events through innovative ways, whether it be by utilizing tools like Snapchat, Facebook Live, Periscope or through communication subsets like the SMS interaction. BG: #Dysturb is a tool for information, and we want to make this researched and valuable information accessible for all. In 2008, Benjamin Girette co Founded the project 24 hours in Europe (with Guillaume Poulet Mathis) a collective documentary project gathering 40 photojournalists to depict their Europe through specific stories in 40 different countries. (http://www.24hoursineurope.com) Since 2011, Benjamin works on National and international news coverage for IP3 Press agency. He made reports from Tunisia for the departure of President Ben Ali and on the aftermath of the revolution. His work also include reports from Italy on the illegal immigration, in Spain during the movement of Indignados and in Egypt for Hosni Mubarak's departure and for the election of Morsi and the recent coup d'état against the elected President Mohamed Morsi. Recently Benja-min went in Ukraine to report from Maidan in Kiev. Benjamin's photos are regularly published in National and International press. Pierre Terdjman began his career in the Israeli daily left wing newspaper Haaretz. In 2007, he returned to France to join the team of photographers at Gamma agency. Since then he has covered the post-election violence in Kenya, the Russian-Georgian conflict, Afghanistan (where he spent a year following a French unit for Paris-Match), and Haiti after the earthquake. More re-cently, he photographed the Arab Spring, covering both the fall of Ben Ali in Tunisia, Mubarak in Egypt and the struggle for liberation against Gaddafi in Libya. He is also regularly in Israel, and is documenting the fall of the Israeli dream in a long-term project called “La La Land”. In 2012, he won a scholarship Photoreporter Festival of Saint-Brieuc to continue his work in the long term. In 2013, he covered the uprising of violence’s in Central Africa for the French maga-zine Paris Match. Earlier this year, he won the Lens Culture Award for a picture from his work in Central African Republic. His photographs are regularly published in Paris Match, GQ and The New York Times Magazine. In April 2015, Pierre joined Getty Images Reportage.